A bold and classic solid-color siding that's available in 6-inch and 7-inch horizontal, or 10-inch vertical board and batten, CraneBoard can work as an accent, or as the focus of your exterior design. 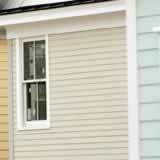 This untextured siding comes in 17 colors and is most frequently trimmed with white. Oracle is a low-gloss, woodgrain siding that offers powerful protection against impact and helps reduce outdoor noise transmission into your home. It's available in two profiles: 4-inch Clapboard and 4.5-inch Dutchlap. This durable option brings the long-lasting look of authentic wood without the upkeep expenses. Featuring a wind-lock system to guard against drafts, American Dream Edge siding comes in both 4-inch and 5-inch panels. Available in an array of 14 colors and featuring a cedar woodgrain, Parkview siding is designed to give your home a seamless exterior look. Parkview-style siding features a locking system that makes installation easier and a thick nailing hem to help resist wind. A stone façade can really make your home stand out in a neighborhood, and BellaStone siding is one of the most accessible and cost-effective ways to get the pastoral look of stone with the benefits of vinyl siding. BellaStone comes in two styles, Torino and Tuscan. It provides protection against energy loss, while bringing the timeless elegance of hand-carved stone to your home's exterior. Portsmouth Shake® siding can give your home the rustic feel of hand-split wood siding without the danger of rotting or insect damage. Portsmouth Shake® comes in seven distinct styles, from straight to staggered, from hand-split to rounded and smooth. The heavily texturized finish of shake siding adds a dynamic visual dimension to a home's curb view. It can help tie gables and other exterior design elements together into a complete picture. These and other siding styles by Crane can be seen in various places around the Web. As with any home building or improvement project, make sure you take the time to carefully determine which option best suits the design vision for your home. The wide range of options for Crane siding can help ensure that your vision comes to life.